White. Elegant, pure and fresh. I love bouquets of fresh white flowers. Vanilla, ivory, cream, seashell - gorgeous shades for delicate flowers. While everyone will be bathing in outrageous red this Valentine's, I dare to be different! It's the je ne sais quoi - the understatement such a bouquet exudes that makes it graceful. When I come downstairs in the morning and these exquisite flowers present themselves in all their glory I can't help but smile. The quintessence of such a bouquet is keeping the flowers delicate and aesthetic rather than going for opulence. 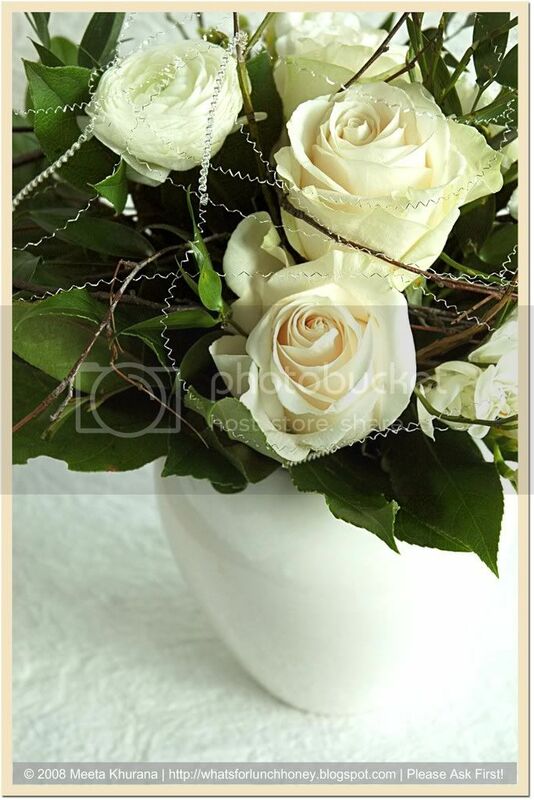 Here I have chosen a few vanilla colored roses and ivory ranunculus, flowers I absolutely love. Simply because they too are modest but beautiful. As a contrast the green leaves build a wonderful background for these flowers to show off their elegant shades of white. The stylish touch comes from a bit of silver thread that I draped around the bouquet. So, while there will be many red bouquets this Valentine's, I give you my pure white one. As a thanks for being all that you are to me and more. My friends, my motivators, my carers, well-wishers, my minglers, my inspirers and admirers - I thank you. Without you I'd only have half of the fun I have on this blog. This is my Centerpiece of the Month and I am sending it over to the lovely Sandi, who has graciously taken over this lovely event. Over at the Daily Tiffin we have a few great Valentine Day related articles. So, please take a few minutes to check them out. Finally I'd like to show you what I recently got in the post. A lovely "spicy" package from my gorgeous better half Jaden of Steamy Kitchen. She started a cool swapping event called the International Spice Swap and sent out 6 packages around the world, filled with spices and her "Secret Steamy Sweet Spicy Sambal"
I happen to be one of the first receivers of these packages. Now according to the rules of the game I am to fill it up and send the box off to another part of the world. Well I just did and am on my way to the mail office right now - with two packages. One to my secret receiver and the other to the Steamy Jaden. Meeta I am always have a warm feeling when i see your pictures which you take with flowers. They are just beautiful. Is this our centerpiece for February? I'll post it. Happy V day to you and Tom and Soeren, Meeta! The flowers are "OH so lovely!" Cannot take my eyes off them - the spice package looks cool and so fun! The flowers bring out the essence of purity! great centerpiece Meeta! Happy V-Day to you guys! Happy Valentine day to you, Meeta! The roses are perfect! Nice Pics. Lovely Roses. Happy Valentine's day! Happy Valentine Meeta. I'm a bit of a pink scrooge when it comes to this day but your beautiful bouquet would soften even my unromantic heart! Even white dishes photograph well and always look elegant. Beautiful center piece Meeta. What a lovely bouquet Meeta! Happy Valentine's Day to you and wishing you a whole year of lovely moments! 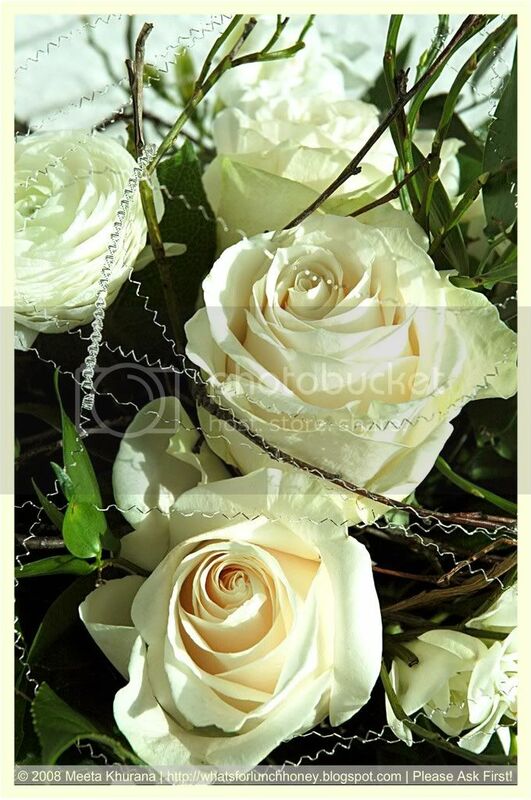 To do a bouquet of white flowers takes a true artist's touch, and you've got that, Meeta. Happy Valentine's Day to you! Wow...the bouquet is really beautiful!!! Hope u had a great Valentine. What a lovely centerpiece. There is something eternally elegant about white shades of flowers. Thanks for sharing it and happy valentine's day a little late.